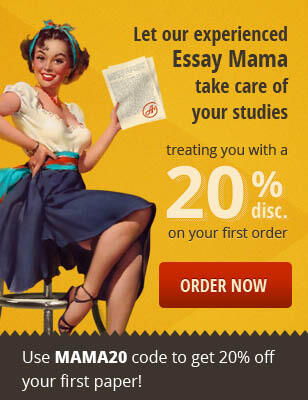 Essay Mama is a trusted provider of quality term papers for hardworking college students. Our term papers are prepared by certified experts in a field specific to the subject matter, allowing us to deliver the highest quality essays possible. We only deliver outstanding original work for our clients in an effort to help them achieve maximum success in critical courses. Term papers from Essay Mama are well-written, insightful and tailored to your requests. Your term paper is thoroughly researched at the time of your order and created from scratch to deliver an original work guaranteed to earn you unquestioned top marks. You will never find experts from your term paper later on the Internet, as each of our term papers is composed as a unique work that reads like it came off your keyboard. Unlike our less scrupulous competitors, we only employ experienced writing professionals that are certified in specific fields of study. We assign each of our clients the best candidate to compose an essay on a given topic and work closely with you to create a superb customized term paper. Our term paper writing services are geared toward clients, not quotas, and our expert writers and customer service agents combine to deliver quality a quality term paper for every orders. Other essay writing services employ inexperienced amateurs that may be faster or cheaper, but risk your educational reputation and standing on inferior work. We accept nothing less than outstanding results from our writers and customer service team so you can expect nothing less from us. That's the Essay Mama difference. Our college and graduate level term papers as well as all of our other essay writing services are guaranteed to be plagiarism free. Educational institutions do not prohibit the use of term paper writing services by students, only plagiarism. We will never risk a promising academic career by handing off a stolen essay to any of our clients. Don't sweat it out with a shady competitor. Bring your project to Essay Mama for a term paper you can trust. Why do you need a term paper from Essay Mama? A term paper is one of the central factors in your overall grade for a course. A quality term paper requires hours upon hours of research, seemingly endless writing and rewriting and highly specific formatting as well as a meticulous citing process that only adds more difficulty to an already time-consuming endeavor. Term papers are hard work, but with all-night study sessions and admissions tests already the norm for many students, not everyone has time to create the type of brilliant term papers that earn top grades, recommendation letters and post-graduate opportunities. Enter Essay Mama. While your job as a college student is to obtain a real world education and train in your career path, ours is to compose high-quality essays that give you more time to do it. The team of professional essay writers at Essay Mama have worlds of experience in crafting excellent one-of-a-kind essays. Think of someone like an electrician. In most cases, you have or can easily gain the knowledge and resources necessary to perform any job he can do. However, most of what he does is much too technical and time-consuming for a busy person to squeeze into an already tight schedule and a single small error due to inexperience could lead to disaster. What is an arduous and inconvenient task for you is another day at the office for him. The same theory applies to term papers, and similarly, at Essay Mama we provide convenience and reliable results for our valued clients.